Several Wall Street firms downgraded their shares of Starbucks, today, after the company showed a sales guidance lower than analysts expected and announced the closure of all 379 Teavana mall-based stores. CEO Kevin Johnson said that the stores have not, in fact, been doing very well. He adds that the company expects to sell more than $1.6 billion of Teavana branded, handcrafted beverages through Starbucks stores, globally, this year. Also, he notes that the tea brand has grown at least 40 percent since its US launch 5 years ago and is up more than 60 percent since its launch in Asia (China and Japan) about one year ago. Wall Street had expected Starbucks to have global comparable sales growth guidance of 5 percent but the company said they would only have between 3 and 4 percent. As such, shares of the world’s most famous coffee chain fell 7 percent in early trading on Friday morning. Perhaps more importantly, though, this probably should not have come as much of a surprise for anyone paying attention to the company’s financials. 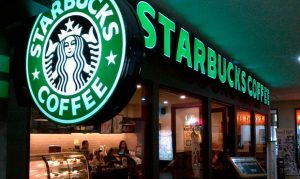 After all, shares of Starbucks only rose about 2 percent over the past 12 months, against the Standard & Poor 500’s 14 percent return. Comparably, Astrachan reduced his price target from $66 to $58; DiFrisco from $70 to $58. Both represent a 3 percent downside.